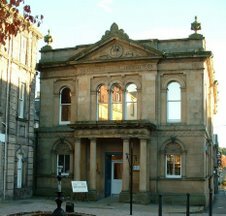 You may be aware that Inverness Museum has recently re-opened. The Friends of The Falconer Museum have organised a bus trip to visit the new museum on 17th March, leaving the Forres museum square at 2pm and returning home at 5pm. After a £1.3 million refurbishment, the galleries have been completely redesigned to present the museum's magnificent collections in an innovative and fresh way. New graphics and display cases have increased both the range of subjects covered and the number of objects on display. There is a lift to the first floor and a new café, museum shop and toilets. This is your chance to see a major new exhibition called Fonn ’s Duthchas : Land and Legacy before it moves to Glasgow, Edinburgh and finally Stornoway. The exhibition is designed to celebrate Highland 2007, using iconic objects, paintings and manuscripts to highlight the rich and diverse culture of the Highlands. It looks at the Highlands and Islands today as well as exploring clans, war, religion, land issues, music and language. By taking a new and innovative approach to well loved objects visitors will be able to find out who has some of the World’s oldest rocks, why Flora Macdonald emigrated to the Americas and the secret of Rob Roy’s sporran! There is a limited number of seats available so get your name in quick!